There’s no other place we’d rather spend the summer than Cyprus. We may be biased, but we can’t understand why anyone would want to holiday somewhere else. It has the perfect weather, the perfect scenery and the perfect activities. For beach lovers it’s a paradise and for those wanting something a little different or a day off from the sun lounger, it’s an island waiting to be explored. At Kalopanayiotis, we are keen to welcome visitors so we can share something tourists won’t find at the big resorts on the coast. We want to give you an insight into mountain village life. The life Cypriots have lived in these parts for centuries and the traditions that we are so determined to keep thriving. 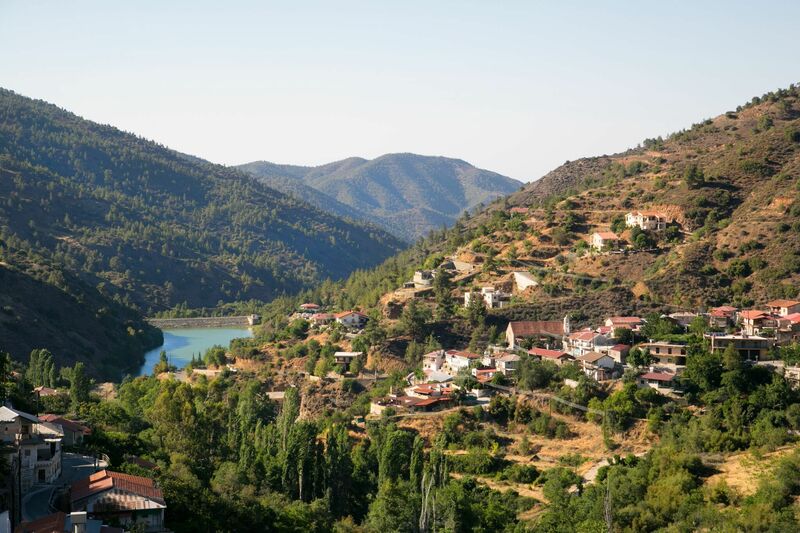 Just a 50 minute drive from Limassol or Nicosia will bring you to the heart of the Troodos mountains. You’ll know you’re getting nearer to us when you can feel the breeze getting cooler and you can smell the blossom. You might bump into Mr Doros on your travels, our village Bee keeper, who collects honey from an abundance of cherry trees, almond trees, lavender and thyme in the area. He’s seventy-five and has collected honey for most of his life. Now a regional expert in the art of making it, he loves nothing more than sharing his skill with visitors. But, we have lots of people like Mr Doros in our village. Take Mrs Aliki for example, our local village seamstress. Not only does she make the most amazing Cypriot sweets (and will explain how she does that, as you are enjoying them), but she will also teach you how to weave a traditional village basket from the reeds she collects down by Setrachos river. It may take you two hours to finish one yourself, but it’s a good chance to chat with Mrs Aliki, who has lived her whole life in Kalopanayiotis. By the end of what can be quite a therapeutic session, you will also walk away with a very useful utensil when it comes to taking a stroll through our orchard. We have many medlar fruits, plums, peaches, grapes, apples and apricots that are waiting to be picked and carried home. Of course if you’ve previously spent long days lying on the sand and it’s left you hungry for something a bit more energetic, there are a number of treks or bike rides that will take you through Moutoulas, Pedhoulas or even all the way to Troodos. An early morning two hour nature walk, listening to the swallows, will take you to Profitis Ilias chapel at the top of the mountain opposite our village. You can see it lit up beautifully in the evenings. But before it gets too dark, we like to watch the sun go down over the hills and enjoy a glass of local wine. Within two years, we’ll be ready to produce our own, which we’re extremely excited about. However, as the sommelier here will tell you, the Tsiakkas and Vlassides wine ranges we currently serve are exceptional and all Cypriot. And if you want to find out more about them, just book in for a wine tasting session in our restored Cava wine cellar. As I say, we are a bit biased when it comes to our beautiful island of Cyprus and our home, Kalopanayiotis. But if you don’t believe what we say, just ask the old and wise resident barn owl. Locals say he is attracted to areas for their good energy… and he has lived in the church bells of Agia Marina for years. So that must be good. You might find it difficult to spot him though as he’s often off to hunt for mice. However, we are pretty sure you will hear him. He tends to snore pretty loudly at night.